Speech Room News is typically geared toward SLPs and other professionals in the field, but this week I posted over at PlayingwithWords365 with some information for parents! If you’re working with any families this summer, Katie’s blog is the place to send them for information! I wrote about tackling receptive language skills at home! These are those quick tips I usually find myself talking to parents about in IEP meetings. Language is often separated into two parts. Expressive language is what your child can say and express verbally. Receptive language is what your child can understand. While expressive language is sometimes to easiest to identify as delayed, delays in receptive language can have a significant impact on a child’s ability to function at home and in preschool. Children with receptive language delays struggle with skills such as understanding directions, understanding stories read to him/her, identifying vocabulary items and answering questions. 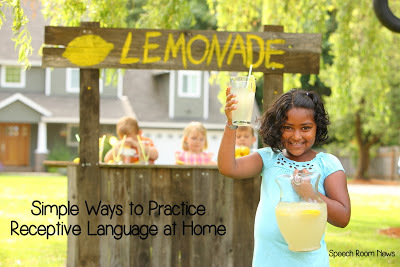 Today I want to share with you some quick and easy ways to support your child’s receptive language at home. It’s quite easy once you think about a specific skill. The key is to pick one skill and have intention to target it throughout your day. Head on over to Katie’s blog to check out the rest of the content!